Political biography, with attention to the evolving ideology of maximum leader. Written during the period in which the Soviet empire was disintegrating, and revised during the Clinton years, but prior to the financial crises of 1997-98. Volume concludes in acknowledgement of nezaversennost, reflecting that it "can have no concluding chapter" (175), that Cuba's "hundred-year-old, and still unfinished, struggle for independence and development" (182) continues. Overall a relatively favorable portrait of Castro, though not hagiographic. Takes a moment in a bibliographic note to pooh-pooh previous volumes written by cold warriors from the United States, "so relentlessly hostile towards Castro that they fail to convince" (184), which are nonetheless qualitatively distinguishable from the writings of rightwing Cuban exiles in Miami, who produce mere "demonologies" (186). Places Castro simultaneously in the regional tradition of Bolivar and Marti (8-11) as well as in the conjunctional current of "Nasser, Nkrumah, Nyerere, and Ben Bella" (175). Presents much of the agitation in Cuba, including Castro's, as partaking of "redemptionist rhetoric" (26), "nationalist regeneration" (28), "inspired by heroic and violent myths" (34), invoking "political models of Chibas, Gaitan, Peron, and even Mussolini" (id. ), a belief that "what was important was not the individuals involved but conviction" (89) (cf. RSB! ), a "militaristic distrust of ideological or cultural pluralism" with "a strong vein of prudishness" (93), along with "voluntarism" (177), as well as private armies drawn from "marginal social groups" (26), a lumpenized uprising, which later manifested as marginal lumpen-peasants during the time in the Sierra Maestra (49)--all things that make me nervous. As much as those items suggest rightwing politics, we also see some stalinist deviations from left politics, such as zhdanovism, show trials, a cult of personality, "socialism in one country" policy, eventually a Cuban-styled perestroika, termed rectification. Some of the stalinist items occur in the 1970s, during the so-called "sovietization" of Cuba, a result of trade & military agreements struck with the Warsaw Pact and Comecon, which Castro had previously resisted. Overall, though, Castro is presented as an earnest, bona fide custodian of the revolution, who regarded himself as a trustee of the state until such time as the citizenry was educated enough and the economy sufficiently developed to resist neocolonialism. I can imagine that this should set off apoplectic fits among rightwing exiles, which makes me smile. Despite the above and foregoing, author notes that Castroism substitutes nation for class, as the Cuban experience can't be "squeezed into the mold of European revolutionary socialism," the "result of class struggle" with an "organized working class" (76), reverses stalinism by insisting that "the New Man would be forged in order to raise the productive forces" (80), and prioritizes "a somewhat idealized peasantry" over "the urban proletariat" (49), all significant distinctions from marxism. The first item "belonged to a different tradition" than marxism's "self-emancipation of the working class," and forefronts "anti-colonial, nationalist regeneration," in which "radical reform and nationalisation were, in theory at least, compatible with a modified capitalism" (42). The second distinction envisioned "new virtues" of "austerity, discipline, selflessness, and comradeship" in order to overcome "centuries of colonialism, sixty years under neocolonialism" (80). The last is linked specifically with the narodnik tradition and maoism, and "articulated above all by Che Guevara," presumably in the foco theory (49). None of that is to suggest that the property basis of the economics was not leftwing: there were waves of progressive expropriations, begininng in the Sierra Maestra. Probably it was consistent with populist land reform, but eventually resulted in the founding of cooperatives and state industries, mass public ownership, and progressive prohibition of private enterprise, down to the least petit bourgeois shoppe-keeper. Curious dialectic regarding the repeated process of the out-group shaking down exiles in Miami for a coup or insurrection, back to Batista at least. 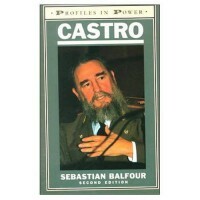 Author generally is careful to distinguish Castro's policy from Soviet policy, one of the major analytics of the book. There were times when Castro followed Soviet orders, such as the 1968 invasion of Czechoslovakia, the 1979 Afghanistan invasion, the Horn of Africa mess, and so on, generally at cost to his international prestige, which was otherwise well developed. Safe to say that author does not regard Cuba generally as a catspaw of the Russian Empire. Because the account attempts to be favorable, it often generates some humorous euphemisms, such as "The Warsaw Pact intervention in Czechoslovakia on 21 August 1968 gave [Castro] an unusual opportunity to begin rebuilding bridges with Moscow" (94). I should think so! Writer appears on occasion to adopt hegelian, if not necessarily marxist analysis, such as when pre-Castro regimes are described as failing because of "the contradiction engendered by Cuba's uneven and dependent development" (60). Chronicles otherwise the changing constitution of Cuba, typically in response to economic circumstances, as well as the relationship with the United States, always a villain in this narrative, and always more important than the Soviet Union. Recommended for unreconstructed cold warriors, wealthy Miami exiles, and those who shakedown wealthy Miami exiles for coup d'etat funds.